CBD (cannabidiol) is the second most common cannabinoid in cannabis and the most common in hemp plants. 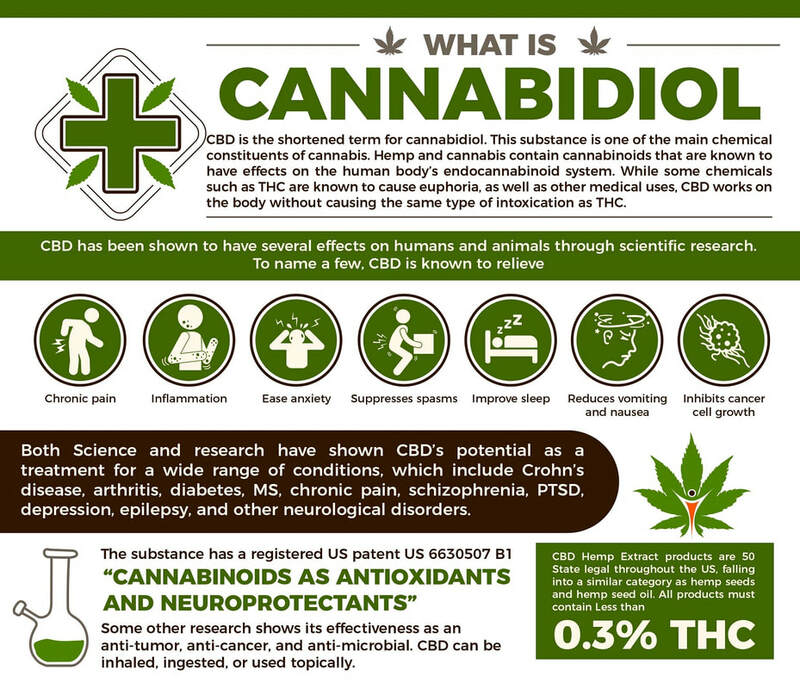 Cannabidiol (CBD) is just one of over 85 cannabinoids that is identified in the cannabis plant. CBD can generally represent 0.1-12 percent of the cannabinoid content of the the plant. CBD rich cannabis (4% or more) provides potent therapeutic benefits without the euphoria or lethargy of many high THC varieties. CBD and THC are believed to have a synergistic effect meaning that when they are both present at therapeutic levels, they are more effective together than they are alone. While THC is widely known for its psychoactive properties, CBD may be best known for its ability to counterbalance anxiety, tachycardia (rapid heartbeat), hunger and sedation caused by THC and its ability to control sever forms of epilepsy. 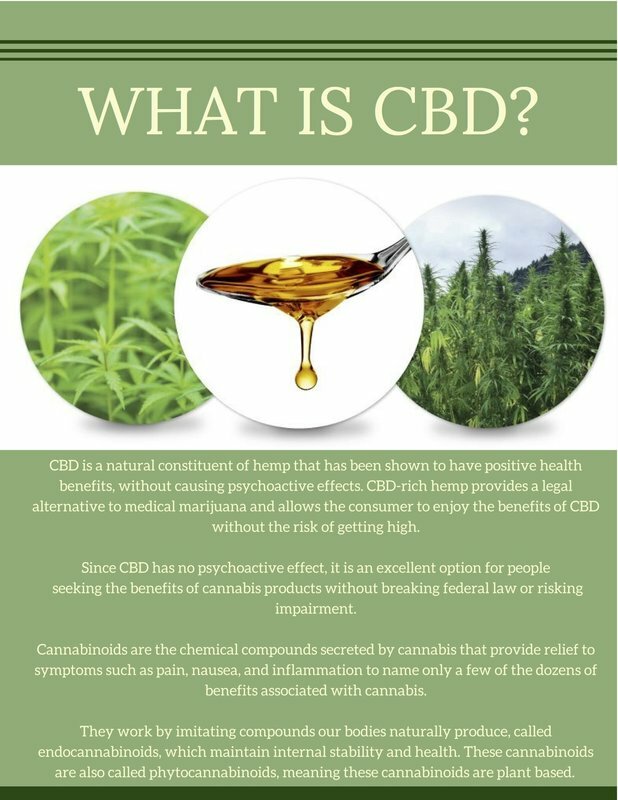 CBD hemp oil is made from high-CBD, low-THC hemp, unlike medical marijuana products, which are usually made from plants with high concentrations of psychoactive tetrahydrocannabinol (THC). Because hemp contains only trace amounts of THC, these hemp oil products are non-psychoactive. It doesn’t cause a high. This makes it a safer, less controversial alternative, while still offering significant health benefits. CBD was once considered a minor cannabinoid under the shadow of THC. What we know now is that CBD is just as beneficial and versatile a cannabinoid as THC in addressing many hard to manage conditions such as diabetes, rheumatoid arthritis, cancer, epilepsy, antibiotic-resistant infections, alcoholism, PSTD and neurological disorders. CBD has very strong anxiolytic (reduces anxiousness), anti-convulsant, anti-emetic (reduces nausea), anti-inflammatory, antioxidant (stronger than vitamins C & E), anti-depressant and anti-psychotic properties. One of the most exciting aspects of CBD is its combined strong anti-inflammatory, anti-oxidant and neuro-protective properties which yields great promise for the treatment of Alzhiemer’s, Parkinson’s disease, and all neurodegenerative-related diseases. CBD also helps regulate blood pressure and is cytotoxic to breast cancer and certain other types of cancer cells while protecting healthy cells. Other more major cannabinoids found in full-spectrum include cannabigerol (CBG), tetrahydrocannabinol (THC), and cannabinol (CBN). Extracted full-spectrum hemp oil also contains a wide list of naturally occurring vitamins and minerals. Present are vitamins A, C, and E., and well as B complex vitamins like riboflavin, thiamine, and niacin. Hemp oil is also a source of vitamins that are commonly not sufficiently present in many diets, including beta-carotene. Minerals are essential for a variety of bodily functions, nerve function and metabolic processes. They’re also important for building strong bones and the health of our blood, skin, and hair. Full-spectrum hemp oil contains minerals like magnesium, zinc, potassium, calcium, phosphorous, and iron. Hemp oil is a healthy source of protein, which is instrumental in building and repairing tissues. Health officials recommend refraining from regularly eating red meat because it’s higher in saturated fat, but hemp oil is a heart-healthy source of all 20 amino acids, including the nine essential amino acids that must be provided through the diet. ​The health benefits of full-spectrum hemp go beyond it being a source of CBD. The array of cannabinoids and other natural constituents found in full-spectrum hemp oil work have been shown in studies to work together in what’s referred to as the “entourage effect.” Together, these compounds work harmoniously to magnify their therapeutic properties. The complex mix of cannabinoids, essential nutrients, protein, and healthy fats work synergistically to encourage homeostasis and balance in our health. ​What is the Endocannabinoid System? ​What are the Health Benefits of CBD? 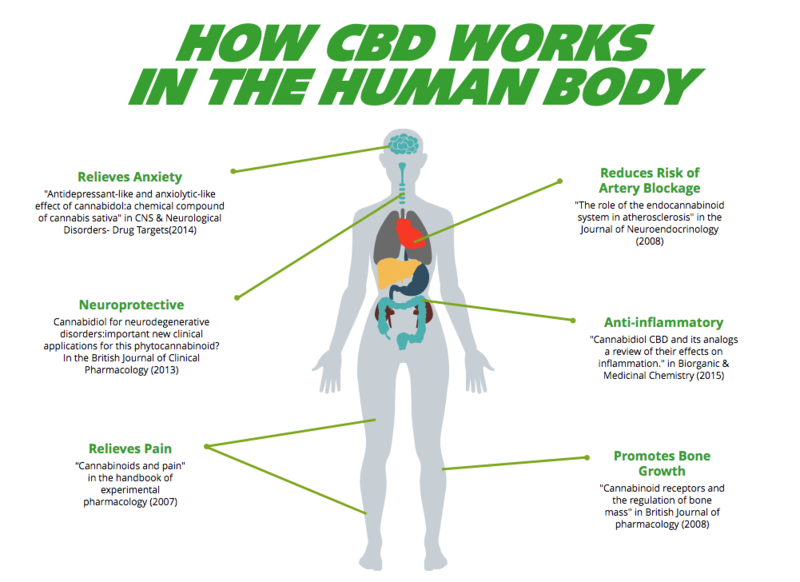 In addition to positively affecting the endocannabinoid system, CBD has been the focus of more than 23,000 published studies about cannabinoids in relation to various medical indications including anxiety, epilepsy, inflammation, cancer and chronic pain to name few. ​​No, CBD does not elicit a high feeling. The naturally low-THC hemp plant, a non-psychoactive of cannabis, grown in many countries around the world and imported into the United States for use in textiles, building materials, and of course nutritional supplements and foods. ​There are thousands of unique varieties of hemp. The cultivars used for CBD oil contain significantly higher concentrations of CBD than others. Using these uniquely potent plants, it is possible to extract cannabis oil that contains a significant levels of cannabidiol, as well as essential vitamins, minerals, fatty acids, terpenes, flavonoids, and other non-psychoactive cannabinoids. ​Does CBD Have Side Effects? Yes, CBD derived from hemp plants is legal in all 50 states. However, much of the CBD industry gets their hemp oil and CBD from overseas. Hemp crops have been planted in states like Kentucky, West Virginia, and Minnesota for the first time in half a century, Hempworx only uses hemp grown within the USA, specifically Kentucky and Colorado. ​Is it Safe to Take CBD? Thankfully, CBD is harmless to use by all the members of your family because it is non-psychoactive and has minimal side effects. Hempworx takes a number of important steps during our manufacturing process to ensure that the CBD hemp oil products that you and your family have come to trust are always the safest and most reliable they can be. ​Scientifically, industrial Hemp and Marijuana are the same plants, with a genus and species name of Cannabis Sativa. They have a drastically different genetic profile though. Industrial Hemp is always a strain of Cannabis sativa, while marijuana can be Cannabis sativa, Cannabis indica, or Cannabis ruderalis. The major difference is how industrial hemp has been bred compared to a marijuana form of Cannabis sativa. Typically speaking, industrial hemp is very fibrous, with long strong stalks, and barely has any flowering buds, while a marijuana strain of Cannabis sativa will be smaller, bushier, and full of flowering buds. However, newer industrial hemp varieties in the USA are being bred to have more flowers and higher yields of cannabinoids and terpenes, such as our Colorado hemp we’re now using! 99% of the time marijuana has a high amount of THC and only a very low amount of CBD. Hemp, on the other hand, naturally has a very high amount of CBD in most instances and only a trace amount of THC. Fortunately, the cannabinoid profile of hemp is ideal for people looking for benefits from cannabis without the ‘high.’ Hemp is used for making herbal supplements, food, fiber, rope, paper, bricks, oil, natural plastic, and so much more... whereas marijuana is usually used just recreationally, spiritually, and medicinally. The term cannabis oil can refer to either a marijuana or hemp derived oil since marijuana and hemp are two different forms of cannabis. In the USA the legal definition of “industrial hemp,” per Section 7606 of the Agricultural Appropriations Act of 2014, is “INDUSTRIAL HEMP — The term ‘‘industrial hemp’’ means the plant Cannabis sativa L. and any part of such plant, whether growing or not, with a delta-9 tetrahydrocannabinol concentration of not more than 0.3 percent on a dry weight basis. Are Hemp Derived Cannabinoids Such as CBD as Good as CBD from Marijuana? The short answer is yes. 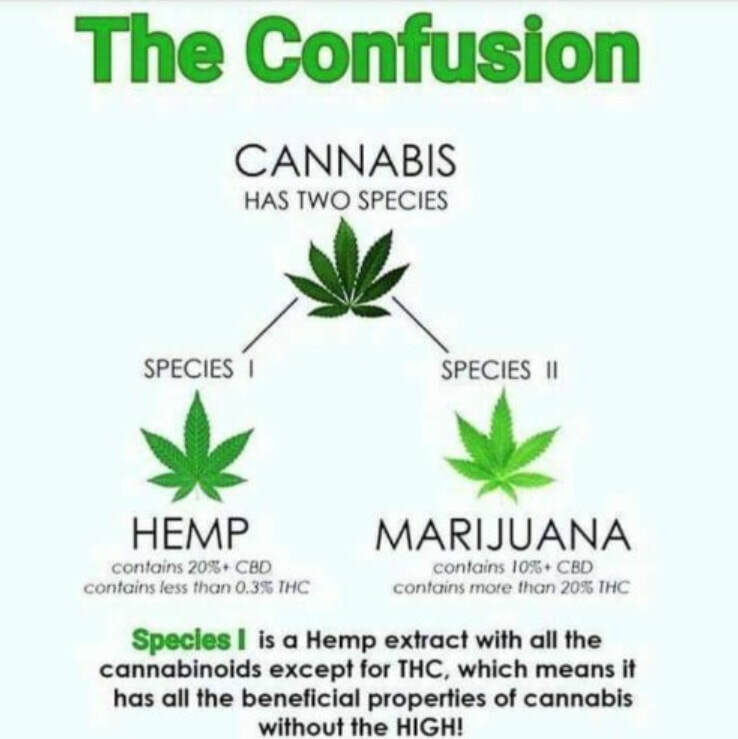 CBD is CBD, whether from marijuana or hemp. Most marijuana has a very low non-psychoactive cannabinoid profile (like CBD, CBC, CBG), so most of the time hemp would be much more preferable for anything besides THC. ​Marijuana is usually very high in THC (gives people the high) but usually very low in other non-psychoactive cannabinoids. Nowadays in the USA, many farmers are growing industrial hemp flowers that are just as beautiful, odor-producing, and terpene rich as the best marijuana strains, such as our partnered farmers in Colorado. At Changing The Future Outcome (CTFO), our CBD products utilize the full spectrum Cannabis plant mixed with Hemp Seed oil. Not all hemp is created equal. Our CBD Oil is made in the USA from NON-GMO, PESTICIDE FREE, CO2 Extracted Hemp Oil. In our experience, a full spectrum plant gives the Endocannabinoid system (ECS) the full cannabinoid profile of CBD, CBG, CBC, CBN, in order to substantiate the health claims. We have over 120 cannabinoids in our CBD formulas which perfectly inhibits the CB2 receptors in the body. While our competitors have gone the most cost effective route and have skimped on ingredients & formula, we are 100% committed to providing the most potent, most pure, and most effective Hemp products on the market. Due to our farming, science, and unique formulations, the CTFO products are trusted by thousands of customers!